Tale of amorous folly and revenge set in the world of the London stage in the late 1930's. Reigning diva Julia Lambert's (Annette Bening) success and fame grow suddenly wearisome. She falls head over heels for a young American, Tom (Shaun Evans), and begins a passionate May - December affair. When she realizes that Tom is just a young social climber whose real passion is ambitious young starlet Avice Crichton (Lucy Punch), Julia begins to plot a delightful revenge. The summary really (nearly) says it all, the original material is by W. Somerset Maugham, so no real surprises in the plot are to be expected. The first time I partially watched this movie was when I accidentally zapped into it on TV. I arrived to enjoy the preparations for the revenge with the final execution of the career of a young actress. Until I finally watched the complete story on DVD I had to ask myself: "What might this girl have done to deserve this?" What really is great about this movie is the extremely good and ambitioned acting starting with Annette Bening as aging actress over Jeremy Irons as her husband and Michael Gambon as ... let's call it "the spirit of inspiration". The whole cast is extremely well chosen and all down to the tiniest supporting role are doing an amazing job here, which alone is worth watching. Star Wars fans travel to Skywalker Ranch to steal an early copy of Star Wars: Episode I - The Phantom Menace. Not quite sure what I actually expected of the movie. But definitely not this: A "Road - Coming of Age - Comedy - Screwball" Movie. And believe it or not, it's actually good (provided you're not a Trekkie, then you are allowed to hate it ). The story is way too much off the track to be "believable", but hey, it's a comedy, if you expect realism watch a documentary. Many of the scenes look familiar and this is intended: We are talking about a hommage to the look and feel of the pre-"Episode I"-era here and so of course you'll find some hints on the movies the nerds wasted their time with until Episode I was released. So all you nerds out there: If you want to make a time travel and remember how it was to wait for Episode I (the, as it later showed, by far worst part of the franchise), watch this movie, it's about you. All the others get a quite enjoyable flick about 5 friends on a mission impossible. Great review! I've never got around to seeing this and I really should. Definitely a "Must" if you can tell (without checking at Google first) the home planet of Chewie. At a Los Angeles hospital in the 1920s, Alexandria (Catinca Untaru) is a child recovering from a broken arm. She befriends Roy Walker (Lee Pace), a movie stunt man with legs paralyzed after a fall. At her request, Roy tells her an elaborate story about six men who are on a quest to kill the corrupt governor Odious (Daniel Caltagirone). 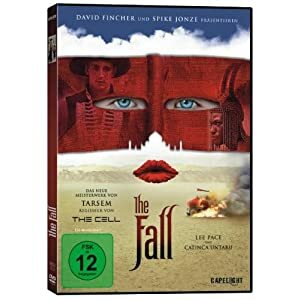 Tarsem Singh once more tries to capture the realms of fantasy onto celluloid and doesn't quite make it. Don't get me wrong this movie is a masterpiece, it shows pictures of a beauty only very scarcely seen on screen, some of them too beautiful to be real, but they all are (some of them with a little help by the production designer, though). What limits the effect is that the story is subordinated to the pictures and by this appears to be somewhat pretentious. It's a nice little story, which changes with the moods of "Roy Walker" and is because of that quite surprising at times, but never too much, so that you aren't distracted from the beauty of the pictures. So, yes I like this movie, but with a slight bitter after-taste: It might have been so much more. 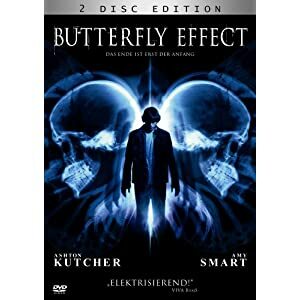 A young man (Ashton Kutcher) blocks out harmful memories of significant events of his life. As he grows up, he finds a way to remember these lost memories and a supernatural way to alter his life. This was the second time I watched this movie. I didn't quite like it the first time and rewatched it today (two years after the first attempt), because I'm frequently told that this is a great movie and I surely must have missed something important if I don't like it. I still don't really like it, probably never will! 1. Ashton Kutcher is a terrible actor, even though for his capabilities he's doing quite well here, it's still far below what a talented actor might have made of this role. 2. The script is full of plausibility leaks! A Fantasy movie on time travel doesn't have to be realistic (how could it be that? ), but at least it should keep to the logical system it set up. While I can accept that those who caused the change of the present still have memories of the alternative pasts, it's hard to see why some of the involved have this too and others don't. I admit that it's quite entertaining (provided you keep your brain in "Sleep Mode") and has an interesting story, but that's about it. Just go with your gut! This is a terrible film. Weird how it does seem to have a degree of respect. I thought the idea for the movie was...interesting, but I didn't care much for it either. I have all three parts! If you've seen part 2 and 3 you'll love the 1st one! Or the boxset was cheaper than the single DVD. I'd still like to know the answer too (that thing above is just something I like to say).